Can you believe it's almost time to fire up the Scoop the Spectator 2014 contest? If you're not familiar with the format here's how last year's game went. While we're waiting for that exercise I thought it would be fun to have a warm-up game. More of a puzzle really, that's targeted at identifying the best wines to taste at this year's Wine Spectator New York Wine Experience Critics' Choice Grand Tasting. This tasting is similar to the Wine Spectator Grand Tour that occurs at about 3 venues across the country each April. See event reports for Boston, Las Vegas, and Chicago. But the New York Wine Experience includes several days of programming including sit-down moderated tastings that cost a couple thousand dollars to attend. But within the New York Wine Experience you can attend just the Grand Tastings which are Thursday and Friday night October 16 and 17, 2014. The cost of just the Grand Tasting is $275. Now, $275 might seem like a lot of money for a wine tasting. And it is. But from past experience at Grand Tour events I can say that these tastings are the best I've found anywhere for enjoyably establishing a relatable frame of reference for the world's greatest wines. Wine Spectator Senior Editor James Molesworth shared this blog post about strategies for getting the most out of the event. At first glance I thought the vendors were set up in random fashion as opposed to by region. But thanks to James' article they're set up progressively by weight. So you could sweep across the room going from Pinot to Port as you'd normally do in any tasting. Clever! Maybe Urban Grape's progressive retailing layout is catching on. But here's the puzzle. 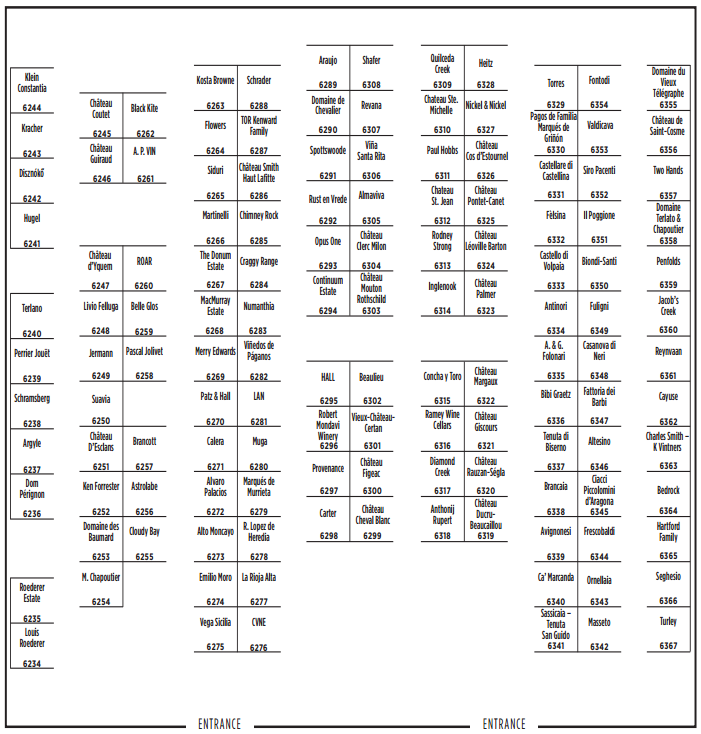 Identify the grouping of the most amazing wineries you can find in the floorplan. For example look at this blockbuster grouping. 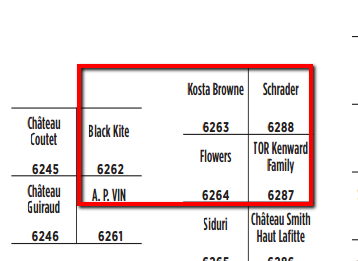 Kosta Browne, Schrader, Flowers, and Black Kite. Talk about a crash course in the great wines of California. Here's another favorite. Harlan, El Nido, and Gaja. What an amazing combination of Italy, California and Spain. Brilliant! And I didn't even mention Lafite Rothschild, BOND, Outpost and CADE. What's amazing about looking at a floorplan like this is that everyone's eyes will gravitate to their categories of familiarity and preference. Is the sparkling assortment amazing here too? Probably but I don't drink much of it so my eyes just pass over them. And that's where you come in. 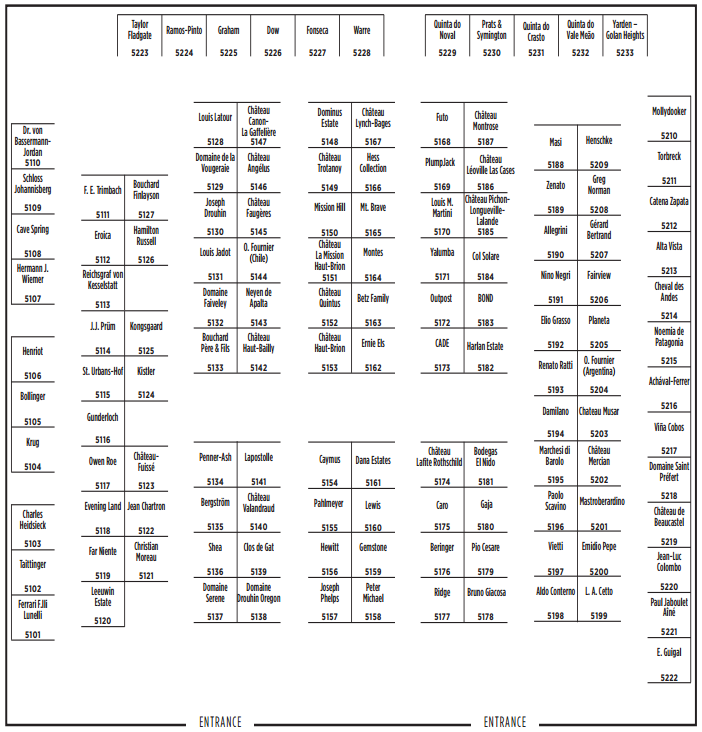 Have a look at the floorplan below and tell me which little row or cluster has the most amazing wineries pouring. Leave a comment below with your picks for the best row or cluster of wineries to visit - I'd love to hear your thoughts. No prizes. Just sharing experience so others who may be attending can benefit. And for those who aren't in a position to attend can live vicariously through the list. For more information and to purchase tickets visit the New York Wine Experience website.